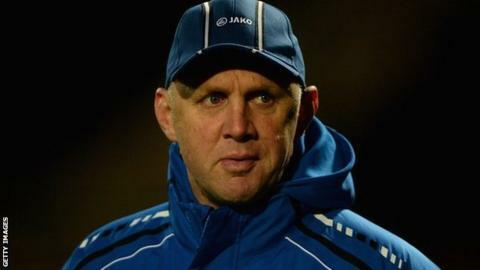 London Broncos boss Tony Rea has quit following his side's 11-game winless start to the Super League season. The Australian was appointed as the club's head coach for a second time in August 2012, signing a two-year deal after taking over from Rob Powell. Tony Rea's long association with the club began when he signed for London Broncos in 1995, playing in the inaugural Super League season in 1996. He later fulfilled roles as head coach and chief executive before returning to Australia in 2008. In July 2012 he returned, replacing Rob Powell as head coach. Assistant coach Joe Grima becomes head coach, having been asked to take charge for the rest of this season and next. "It was always intended Joe would take over as head coach towards the end of this year," said chairman David Hughes. "He was highly recommended when he joined us from St George Illawarra Dragons, where he was assistant coach. "Joe always had an ambition to be a head coach in Super League and will be free to form his own coaching team." Rea's exit follows the departure of chief executive Gus Mackay, who departed after more than three years with the club in late March. Mackay presided over the club's move to The Hive this year after leaving The Stoop, which they had shared with rugby union side Harlequins for six years. The Super League strugglers continue to face financial problems, but the club acknowledge the work Rea played in helping them avert the threat of administration over the winter. "Tony was instrumental in saving the club," added Hughes. "In hindsight, maybe it was far too late but we did save the club. So it's a big thank you to him for assembling the squad and putting us in a position to go forward. "We thank Tony of course, not just for the last two seasons, when he came back from Australia to help us out, but for his work with the club in the past, which everyone is aware of." Rea told BBC London 94.9: "I would rather have stayed on and finished the job this season, but I accept that's not my call. It was always intended that I wouldn't be here next year and David, more than anyone, felt it was a good time to do it. Joe Grima spent 19 years at Parramatta as a player and then coach. Also assistant coach to Ricky Stuart at Cronulla for three years. Was in charge of Malta's national team (2005-2012) and involved with Australia's youth set-up. Joined the Broncos in February from St George Illawarra Dragons. Not to be confused with Joe Grima, the ex-Widnes lock forward. "We've held together well and I feel we're going to have a really good second half of the season and prove everyone wrong. I know Joe feels the same. I'm sad that I'll not be a part of that, but I accept that it's the best thing to do. "In planning for the future, both short and long term, we thought it was best for all of us, the club and myself, that we give Joe the opportunity to take the club on. He's a good man and has got the club at heart. "The troubles of the recent past have been well documented and took a lot of dealing with but we got the club up and functioning. We've had a difficult start to the season but things are about to happen."